The food truck industry is one of the fastest growing sectors in today’s world. Over the last five years, more and more people are switching to food trucks with new vendors catering to niche markets. Customers’ preferences keep changing when it comes to food; the unique flavors of different food trucks increase the options of getting a low cost, high-quality gourmet food. Why Invest in a Food Truck Business? During the 2008 recession, unemployment was skyrocketing and the economic collapse forced many people to lose their jobs. In those times, food trucks started to appear in most cities within the U.S. Major cities like New York, Los Angeles, Austin, and Seattle had food trucks popping up all over different neighborhoods. Investing in a food truck is lucrative because it’s everything that a customer would want… a quick bite, high-quality, freshly prepared right in front of them and reasonably priced. Affordable gourmet food was the only sector in the food and beverages industry that saw a boom, even in the tough recession of 2008, because affordable food was still a necessity for most people. We all have to eat to survive! The only setback in establishing a food truck business is the many regulations that vendors have to meet before they get their permits. In most counties, the laws specify the hours during which the caterer can operate along with the distance it covers; it must not be too close to a brick-and-mortar restaurant. As food trucks are offering affordable gourmet food, restaurant owners and other eateries are lobbying against the food truck industry. Another challenge is that the food truck industry is starting to reach its saturation point in some cities and localities. The high saturation can lead to lower profit margins and slow growth. Despite its challenges, the industry holds a promising future. Food truck owners find new ways to use their mobile restaurant in order to keep their business lucrative. Most caterers have an understanding of running an off-site operation. For many restaurant owners and those willing to start a business in the food industry, a food truck is the best way to take their innovative dishes to other parts of the city. Apart from cruising in the streets or parking in a business center, a food truck can offer catering services for birthdays, spring breaks, weddings, and any other special or corporate events. Instead of a catering service, hiring a popular food truck brand will add life to any event. Catering to this niche market is an important step for the future of a food truck venture. Several couples now prefer to have a late night snack at their weddings because it adds something new to the traditional wedding feast. Depending on the venue and client, they could order a full meal or snacks for guests to nibble on. In the future, its highly likely that people may invest in a food truck rather than a full restaurant, bistro, or café. The preference of getting into this business shows that, for many people, investing in a food truck is much more feasible than opening a bistro or even a small café because it requires a minimal initial investment. A food truck is more likely to get profits more quickly as it has the option of changing its location or keep serving on the go. 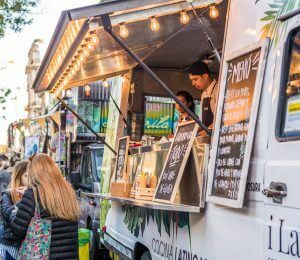 Travelling to different locations and offering different types of drinks and food in various locations increases the market reach of a food truck. The future of food trucks is promising as many large food brands are entering into contracts with food truck owners to promote their brand. In return, the major food brands offer compensation and sponsorship for promoting their product. Getting into a contract to promote a brand will increase the market concentration of both the food truck and the brand it promotes. Despite its challenges and regulations by the city or county, the food truck business is booming and it will continue to do so in the future. Entrepreneurship is on the rise and this particular industry in food and beverages requires little initial investment. This makes investing in a food truck business lucrative as it has many other opportunities for expansion in less time.